The Chrysler Portal's OLED instrument cluster was developed by Samsung. Cockpit designs for self-driving vehicles are rapidly moving from Disney Tomorrowland fantasy toward the real world of commercial production and driver practicality. Concepts that have reached audiences in recent months have featured next-generation cockpits laden with new approaches to seats, displays and gadgetry that are to hit the road over the next five years or so. But behind the fanciful styling of these interior design exercises, some down-to-earth technologies are coming into focus. Concepts such as the Chrysler Portal, Yanfeng XiM17 and BMW i Inside Future won't reach dealer showrooms in their current form, but the technologies inside are very real. 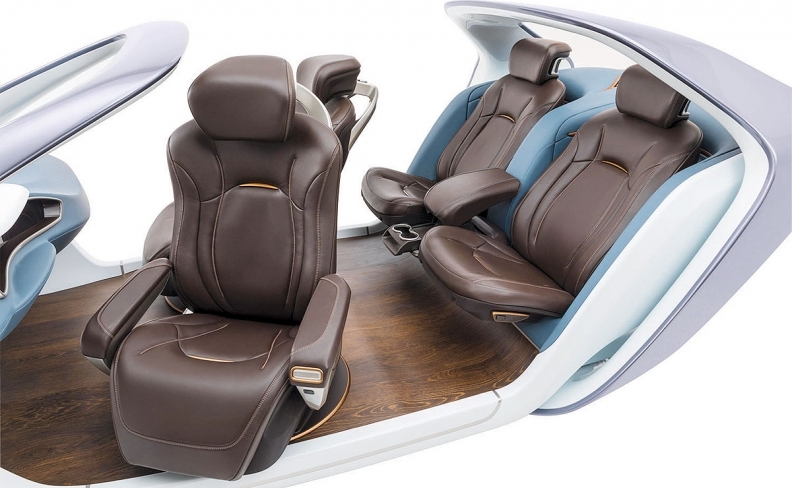 Here's a look at some promising interior components contained in the new crop of concepts. Why automakers are interested: A virtual display above the centre console allows the driver to adjust controls with gestures. This could be useful when the vehicle is in self-driving mode and the driver's seat is swiveled away from the dashboard. Challenge: BMW has introduced gesture controls. The big issue is customer acceptance. Commercial outlook: Look for this feature in three to four years. Why automakers are interested: When the vehicle is driving itself, the steering wheel retracts into the dash to make more room for the driver. Challenge: How quickly can the driver resume control? That's a big safety question for all automakers. Commercial outlook: This seems likely. In January, Nexteer introduced its retractable Quiet Wheel and announced a partnership with Continental AG to develop steering systems. 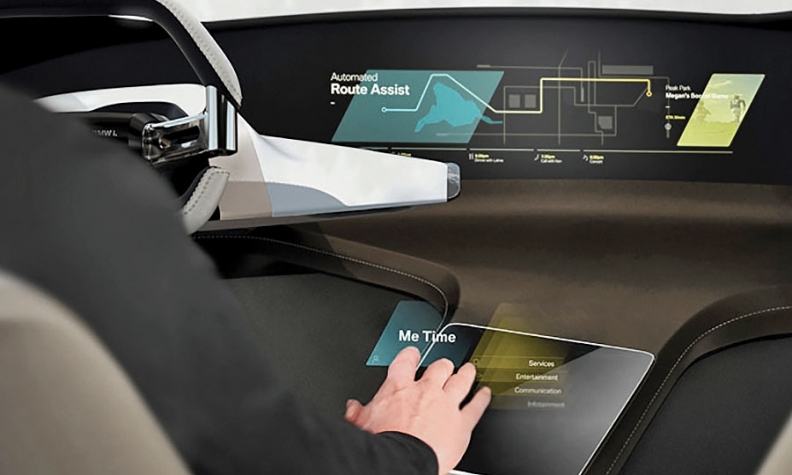 Why automakers are interested: An information display can be pasted on just about any interior surface with OLED -- a thin film that lights up when electricity passes through it. 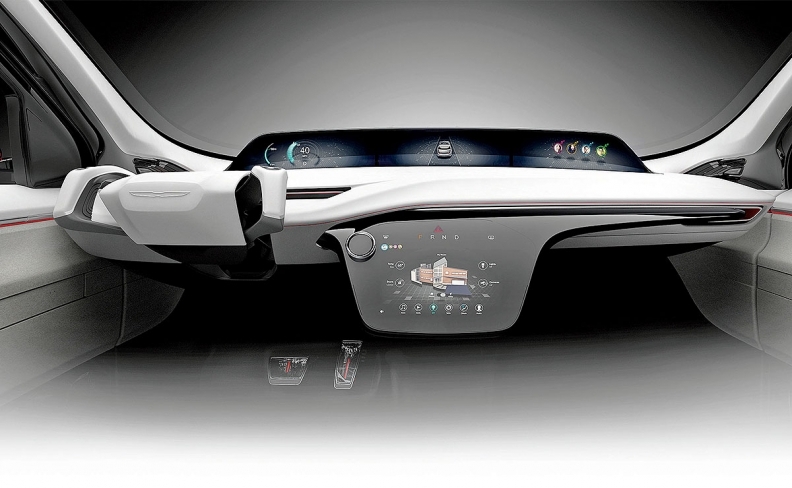 The Chrysler Portal's OLED instrument cluster was developed by Samsung. Challenge: OLED displays fade over time, but engineers say this is solvable. Why automakers are interested: Autonomous driving means passengers will want to move into new positions. Adient has designed a rotating seat with a thin back to add legroom for rear passengers. A control panel on the armrest lets the driver adjust infotainment, cabin temperature and other variables when the centre console is out of reach. Challenge: These seats will require redesigned airbags and climate control. And automakers have been nervous about customer acceptance of thin-profile seats. Commercial outlook: A good bet in three to five years. Why automakers are interested: The display can illustrate turn-by-turn navigation, display real-time traffic updates, point out landmarks and communicate driver information. Continental AG developed an advanced head-up display unit with sharp, colorful images that play across the windshield. Challenge: The technology consumes more space behind the dashboard. It's also pricey. Commercial outlook: Continental plans to launch production in 2018. Why automakers are interested: Biometrics security features are becoming more common in consumer electronics. If ride sharing catches on, biometrics could keep track of multiple users. A camera behind the steering wheel can photograph the driver's face. On subsequent trips, facial recognition software identifies the motorist and sets radio stations, climate control and seat position accordingly. Challenge: The feature has been used for smartphones and laptops, but engineers have to make it automotive grade. Commercial outlook: Fiat Chrysler says it's evaluating a system developed by Panasonic. Why automakers are interested: Narrow and less visible air vents address the design complaint that vents "take up a lot of space and are traditional and ugly," said David Muyres, executive director for r&d at Yanfeng Automotive Interiors. Making vents smaller frees up space for more electronics. Challenge: The thinner openings still have to provide passengers with the same air flow satisfaction and versatility in air direction. Commercial outlook: Yanfeng says the approach is ready for market now. Stephanie Hernandez McGavin contributed to this report. Will cockpits of tomorrow require one-stop suppliers?